Now I wasn't the swiftest kid in math class but I seem to recall the motley crew of the ORCA estimating the length of that Great White at 25 feet. Must be Bruce's big brother. 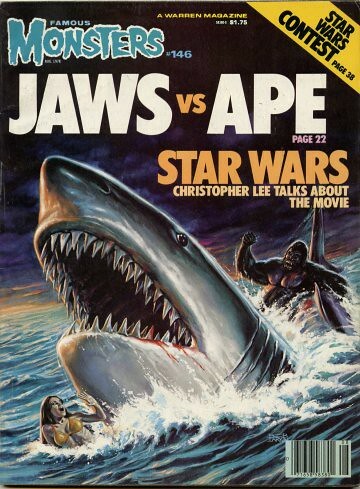 Okay, so this ain't no comic book cover, but I also have a soft spot for JAWS and I couldn't resist. Now here's the stuff that mysteries are made of! This still is among the images that Charlie's daughter, Diana, had sent along to me a few years ago. Initially I had dismissed the image as possibly belonging to another performer's film but when checking out the image for posting this evening, I have surmised that it is Charlie in the foreground. I cannot for the life of me, figure out what film it may have come from. 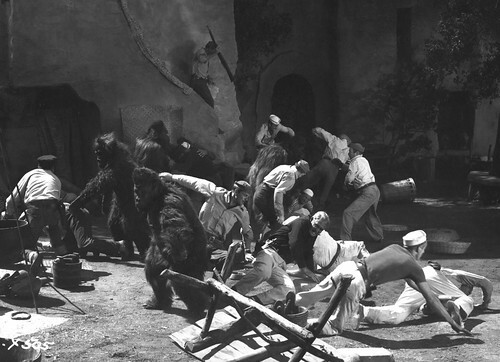 The suit appears to be the same one used for the Abbot and Costello flick AFRICA SCREAMS(1949), so it would peg the appearance from the early fifties. What I find terribly odd, and a little exciting (for a gorilla geek) is the ape to left of our possible Gemora. 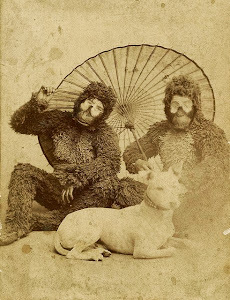 Call me crazy, but I will be damned if that isn't Emil Van Horn; the arm extensions and signature mug are hard to confuse with other major Gorilla Men. 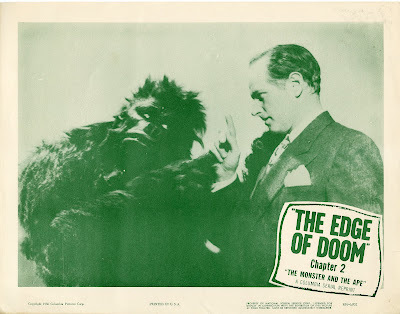 I spent the day in the sun so perhaps my brain might be cooked but I also think the gorilla facing the opposite direction next to 'Emil' has a profile that makes me think of the suit worn by Art Miles! Perhaps I should sleep on it and see if I am seeing Gorilla Men where there are none tomorrow. 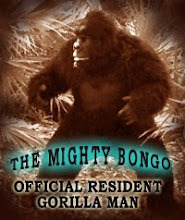 Maybe our resident Gorilla Man himself, The Mighty Bongo, can shed light on this furry conundrum! 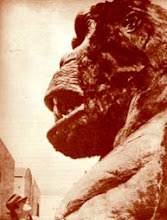 A couple of posts ago, we were treated to photos of Charles Gemoras incredible "Sultan "the gorilla from Phantom of the Rue Morgue. 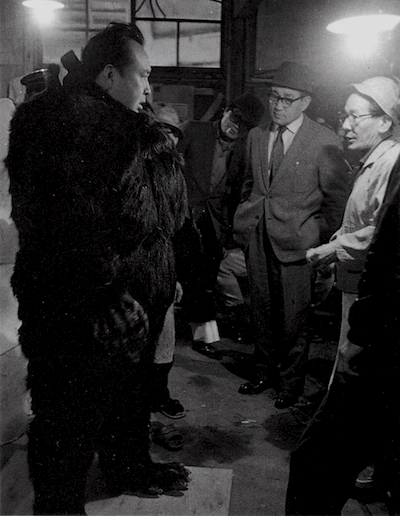 At the time Charles built "Sultan", he had reached the zenith of his gorilla creating career. 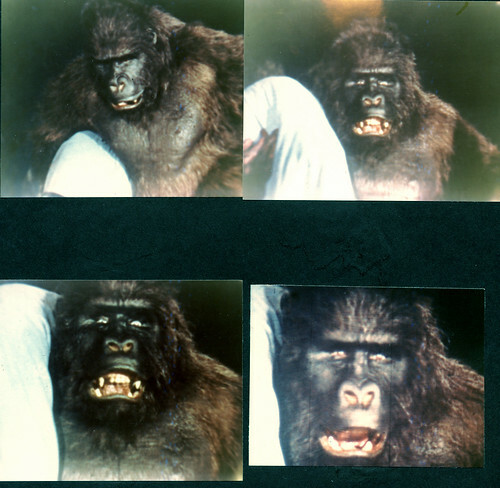 Bob Burns and I have spoken numerous times about the striking realism Charlie was able to achieve in this, his last gorilla suit. 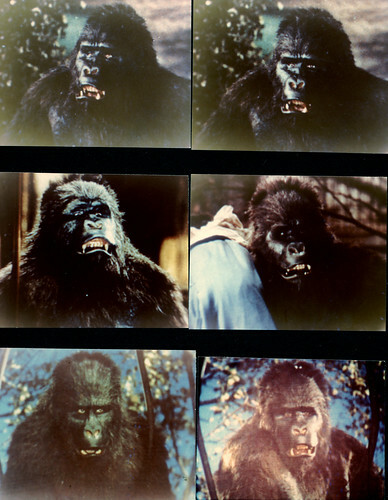 Sultan featured not only the most realistic appearance ever achieved in a Hollywood gorilla, but included water filled bladders concealed in the suit, in areas where the actual heft of a real gorilla would have movement, the chest and belly for instance. The realism of the face went unchallenged into the late 60's and early seventies. 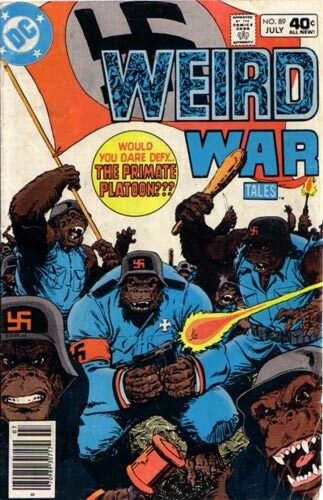 If you were to say; what about Planet of the Apes ? 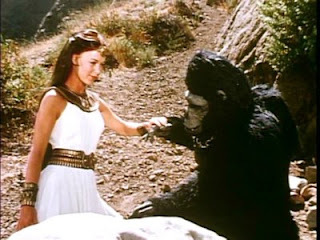 they were still a blending of human characteristics and apes . If you put General Ursus and Sultan next to a real gorilla, and asked people which looked most like the real gorilla, Sultan would win hands down. But Sultan was the last of a long line of Gemora gorillas, who have all been from the very first gorilla Charlie ever made , to the last, always ahead of the pack in terms of realism . 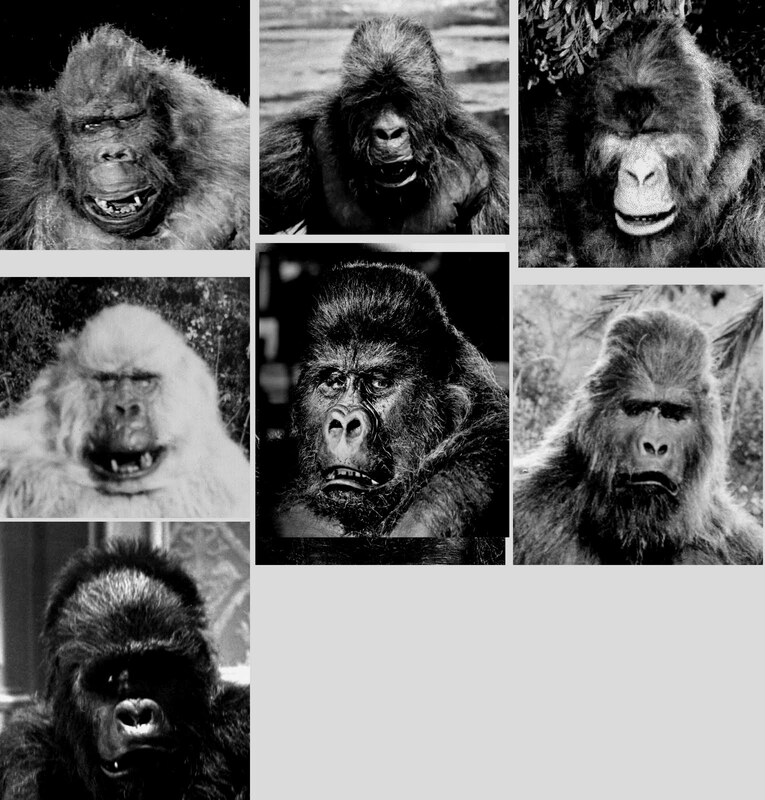 Here, for your enjoyment is a collection of the many fearsome faces of Gemoras Gorillas ! While GO AND GET IT is not strictly a gorilla suit film, the occasional ape man flick is always welcome here amongst the cinema of his anthropoid brethren. Image is by the way of the always awesome MONSTER CRAZY. Check 'em out. There are a few guys who've played gorillas over the years who have actually gained a certain measure of fame for their cinematic simian exploits. For every Gemora, Corrigan, and Burns out there, there are an equal ( or greater) number of sweaty, hardworking guys shambling about in fur, who have received little or no recognition for their efforts. One such man is Fred Humes. 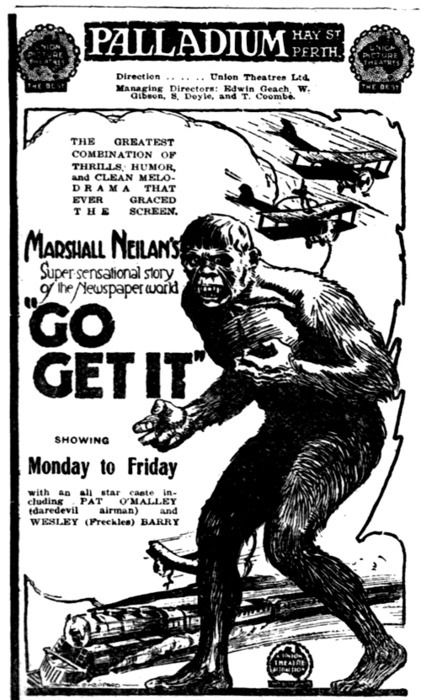 While primarily a western actor,Fred played gorillas in several film in the 1920's. 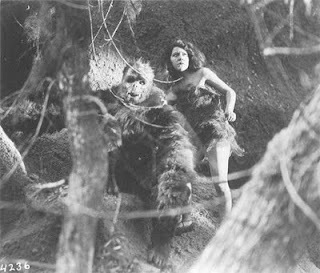 Most notably "Lorraine of the Lions 1925" and "Circus Rookies 1928" in which he played Bimbo the Gorilla.Whilst dredging the web for whatever tidbit of info I could find, I came across this article about Fred Humes. While the contents of the text are not complete, It offers a glimpse of Freds formidable alter ego, while describing a bit of the workings of the head. The suit is beautifully executed, in a style very reminiscent of the works of Charles Gemora. 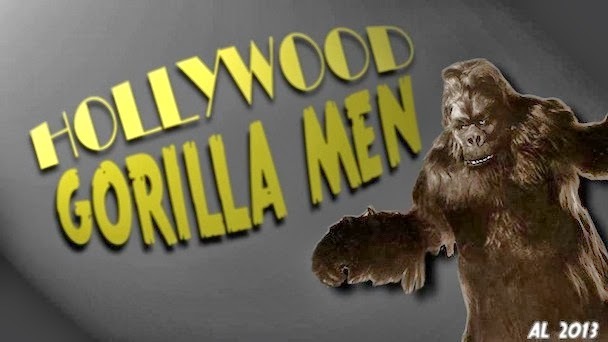 There are most probably several other films and shorts in which Mr. Humes may have portrayed a gorilla, but as most Hollywood Gorilla Men went uncredited, we may never know for certain how many there were. Corrigan gets a wag of the finger for his murderous moneyshines.